If, like me, you are slowly inching towards holiday time by trying to finish knitted things, trying to finish bits of pre-holiday work (agonizing, I tells ya), trying to remember if you have everyone’s presents accounted for, or are perhaps generally feeling a little sluggish and prone to over-pondering the state of the world, then please accept this humble suggestion. Go find whatever scraps of yarn which are sitting right now in a bag in your stash waiting for a Useful Moment, grab that handful of corks that are at this very minute sitting in an empty jar in your pantry waiting for Another Useful Moment, and make some of these little dudes. Seriously, they are good for what ails you. 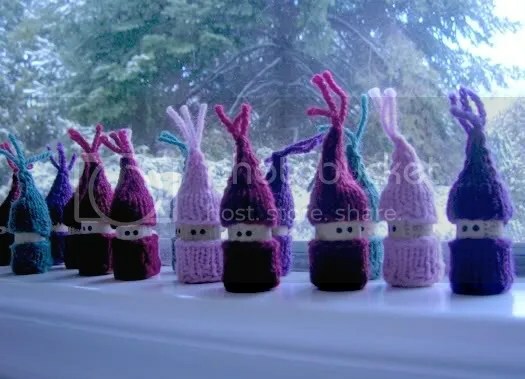 At first you might, admittedly, feel more than a little foolish knitting tiny hats and sweaters for corks, but as soon as you get out the black Sharpie and give them eyes, well. It’s pretty ridiculous how awesome they are to look at. I made quite a few of these wee ones last year, over 50 in fact, and over the past couple of weeks have been gradually growing a new little flock. We’ll see how big it gets this season. Now, the one possible downside is that it is hard to make any of these without corks. There is one very easy way to fix this, of course, and said method may also help contribute to increased holiday cheer. I leave the decision up to you. I hope all of you out there in blog-land are doing well! Have some cookies and hot chocolate for me. Too cute! I can’t believe how many you’ve made. I made one last year, and it filled me with joy. It occurs to me that those would make pretty nifty ornaments, if one were inclined to decorate a tree. I have no saved corks, alas. But I do have tons of amber medicine bottles. Hmmm. Oh I had forgotten about these. They are so cute. I MUST remember them for next year!!! They are so cute. I am sure you will have a whole battalion of these before Christmas. Happy knitting. How cute. Thanks for sharing and have a wonderful Christmas! Happy knitting. Those are too cute. Can you make them with Plork too? (Wine bottles these days – cheaper ones anyhow) come with these plastic cork things. Does it work just the same? Or it isn’t just right? I know there is a dollar store near me that sells packages of cork in their art section. So is the new flock or some of last year too? I imagine a house filled with them come new year, very cute. Hasn’t this year gone so fast? Your little cork men are great again, I need to find mine in the decoration box! These are too cute! Definitely an incentive to drink (even) more wine! LOL those are adorable. I can see how they would get addictive. They would be great to make a whole little village of Corkies.